AS SHOWN As shown: Oslo table, Oslo bench, Bronte dining chairs in smoke. Heal's Designed by You collection of dining tables and benches allows you to create the perfect bench for your space. 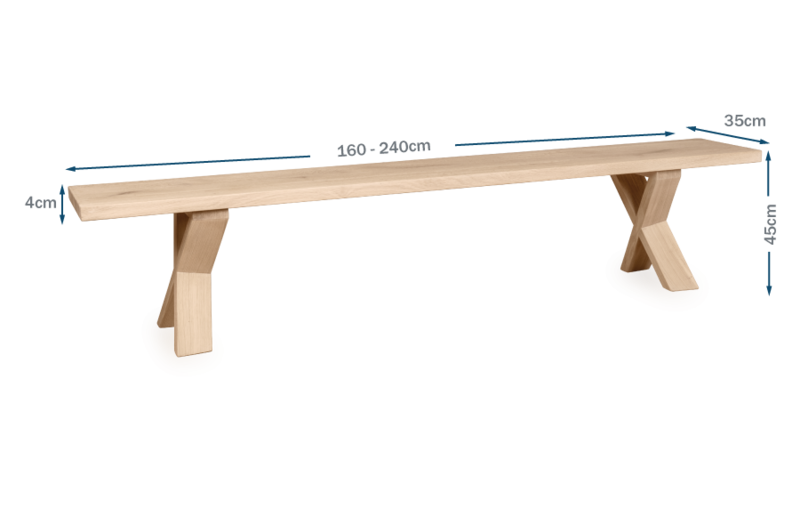 Our benches are made of solid oak or walnut in an oiled finish and are available in five lengths, 6 different wood finishes and 2 different edge profiles to create a bench that is the perfect fit for your home. Grain, knots and cracks are a natural property of all solid wood and add beauty and interest. Each piece is unique and will have a different grain pattern and variances in shading and colour. This is the charm of solid wood and is a different look to veneers which are more uniform. The oiled finish will enable the bench to last a lifetime with a little love & care. The Oslo bench has a modern refined timber criss-cross base with beautiful angles. The benefit of an oiled finish is that with a little love and care the tables can be maintained to last a lifetime. Solid oak bench top with a white oiled finish. Timber criss-cross base with beautiful angles. As shown solid oak bench top with a white oiled finish, solid walnut also available.